THE WORLDS of orchestral music and contemporary jazz have always been, for me, on a par, their life-enhancing qualities able to spark a similar depth of emotion and appreciation. Sometimes, however, when the two are brought face to face, the result can be less than convincing – at best, forced and unnatural; at worst, excruciatingly unpalatable. A successful synthesis requires an equal measure of advanced compositional and improvisatory insight, as well as accomplished performers who are responsive to the demands and challenges. Cue pianist/composer Gwilym Simcock, The City of London Sinfonia conducted by Clark Rundell, double bassist Yuri Goloubev, drummer Martin France and guitarist John Parricelli. Classically trained, Simcock already has, in his early thirties, an extraordinary track record: involved in a huge array of international jazz projects; BBC Radio 3’s first New Generation Artist; various premières and commissions (including the BBC Proms); recently instrumental in the realisation of the inaugural BBC Young Jazz Musician of the Year competition; and a string of solo and collaborative album releases to his name. So it’s fascinating to hear these new works, specifically written for orchestral and chamber formats. Instrumation presents two original five-movement suites: Move!, a City of London Sinfonia commission for piano, orchestra, double bass, drums and guitar; and Simple Tales (more a collection of individual pieces) for quintet – piano, violin, cello, double bass and drums. Both are through-composed by Simcock whilst allowing improvisatory freedom within – and there’s a discernable sense of engagement and drive amongst the players which informs the cohesion and sophistication of this crossover. 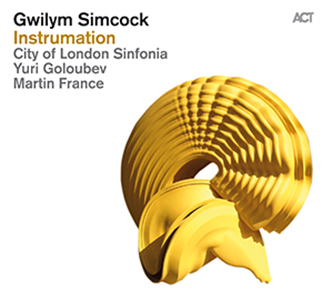 Opening movement Clunky instantly reveals Simcock’s skill in conjoining orchestral and jazz quartet elements as the pressing momentum is embraced by all (this is no bolt-on orchestral backing). The palette of colours achievable in this vast line-up is impressive, the whole canvas filling until Simcock offers the first of two improvised piano interludes which bridge the three main movements. Chromatically-searching Interlude #1 becomes progressively Gershwin-like, connecting seamlessly with Columns, a statuesque and sumptuously-scored ‘Manhattan soundtrack’ which sees Simcock writing eloquently for brass (no surprise, given his own flair for the French horn). Interlude #2 finds the pianist exploring the physicality of his instrument, registering heavy muted strings, bodywork thumps and rapid, low register keyboard runs before bursting energetically into Industrial (For Alan), dedicated to his father (who, he says, appreciates “a tune you can actually tap your feet to!”). This final movement is the most intensely rhythmic, featuring echoic electric guitar from John Parricelli and measured drumming from Martin France (the extended drum and piano duet section particularly striking). Again, the City of London Sinfonia’s involvement is completely integral, combining with Simcock’s supple piano soloing to conclude what is a riveting (and no doubt exacting to perform) ‘big band’ finale. Simcock’s writing for quintet feels natural, his signature jazz piano style in Overture elaborated upon by the violin of Thomas Gould and cello of Will Schofield (the original trio concept was reworked to include bass and drums, which now provide its gentle impetus). The Theme is more introspective – lush chords plus Yuri Goloubev’s typically sensitive bass soloing; and Mr Bricolage dances both vibrantly and mischievously, the players revelling in its folksy freedom, and Martin France providing the flamboyant percussive license to ‘go for it’. The several minutes of Long Road meander in and out of ‘classical’ and ‘jazz’ piano trio formats (at times, perhaps a strange marriage) until, finally – this time in dedication to Simcock’s mother and her love of Celtic folk music – Dance! (for Ann) skips and pirouettes brightly (plucked strings reminiscent of Ravel or Britten, and Thomas Gould’s showy fiddle à la Mussorgsky), the five-piece seeming at its most balanced here – a joyous conclusion. Released in the UK on 7 April 2014 by ACT Music.